Police certificate translation is just one of the many services that Perth Translation provides. Our professional NAATI translators with years of experience perform our translations. We make sure that your important documents will be translated with accuracy and speed. Our translation services are well known in Perth for meeting the high standards of NAATI. If you are in need of a police clearance certificate translation in Perth, we have the best prices. Perth Translation has seasoned translators who are NAATI accredited to producing translations that can be used for any official purpose. Our translations have a 100% guaranteed acceptance rate in any government department that asks for NAATI translations. Perth Translation’s pricing starts at only AU $69 for every page of a police clearance certificate translation. Get a quote on your translation via the online quote form found on this web page. Our price varies according to your document’s length, language and deadline. Please include your requirements and additional requests for your police clearance certificate translation when completing the form so we can provide you with an accurate post. With our standard police clearance certificate translation, your translations will be completed within a 2 to 3 business day’s turnaround time. Aside from our standard processing time, we also offer urgent translations where we deliver your translated document within 24 hours! Perth Translation is a NAATI certified translation company which conforms to the highest standards of translation quality. With us, you are guaranteed to receive only high-quality translations. We maintain 100% confidentiality for every document that we receive. Our translators are well informed and trained in prioritising our clients’ security. When you choose us, you can be sure that your documents are kept safe and secure. Our dedicated customer service representatives are always available to help with your translation needs. You can get in touch via the Live Chat. One of our staff will reply in minutes. Upload a photo or scan of your police clearance certificate using the free translation quote form. Receive our translation quote in your email. We will get in touch in less than 15 minutes after you submitted your document. Send your payment to confirm that you are availing our police clearance certificate translation. We accept payments from all major credit cards, PayPal and direct bank transfer. Once your document is translated, we will send you a draft of your police clearance certificate translation so you can check the dates and the names. Once you approve the draft, we will send you the NAATI certified final soft copy of the translated police clearance certificate. And you’re done! If you need a certified hard copy, we can definitely deliver one to your preferred address. Just let us know, and we will be happy to assist you. 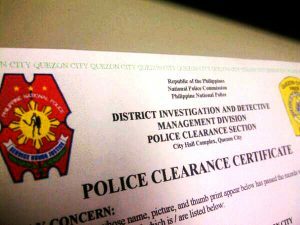 Why is a Police Clearance Certificate Needed? Avail of our police clearance certificate translation and receive the certified translation in no time! They were excellent. Quick, professional, and thoughtful. Very capable and quick in their commitment and at the same time friendly people. I recommend to anyone who needs to be helped by their experience.